Download our "Event management compliance checklist"
It's essential that you're up to speed with event compliance guidelines, download our checklist for compliance in 2017. Planning and managing a professional corporate event entails several elements – each just as important as the next. You may have the perfect venue, a guest list that's filled with VIPs and catering courtesy of a world class chef, but if you're not au fait with the correct event compliance procedure, you could end up with a disaster on your hands. Who has indicated that the premises are safe? Have you checked the occupational health and safety legislation? Who will implement your safety regulations? What event management software can be used to ensure all factors of your event have been considered? Have you conducted a risk assessment or formulated and implemented health and safety policy? Have you conducted in-depth research on all role players that will be liable to ensure the premises and substances do not put the health and safety of the guests at risk? These are just some of the factors that play a role when it comes to compliance. 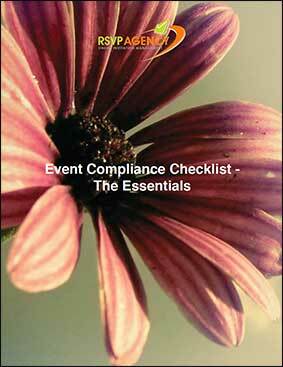 Note: Event compliance entails countless considerations, regulations and best practices.